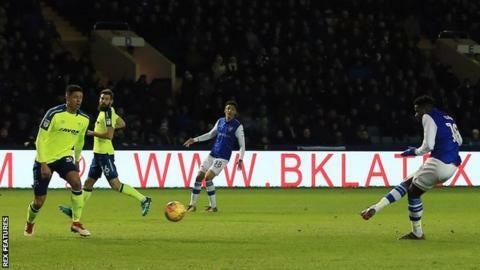 Lucas Joao scored twice as Sheffield Wednesday eased past promotion hopefuls Derby for their first league victory under Jos Luhukay. Jack Hunt controlled Adam Reach's cross and laid the ball back for Joao to fire in the opener. Joao doubled the lead after the break, cutting in from the left and finding the bottom corner from 25 yards out. Derby improved late on, but Matej Vydra shot wide and Joe Wildsmith denied Andreas Weimann as the hosts held on. The victory was just the second in Sheffield Wednesday's past 20 attempts against Derby, who had previously conceded only two goals in 2018. Luhukay's side are now nine points clear of the relegation zone, with an FA Cup fifth-round tie against Swansea and former boss Carlos Carvalhal to look forward to on Saturday. Derby's disappointing night means they stay third in the Championship table, one point behind second-placed Aston Villa, having played one more game. The Rams had far more possession than their opponents and took 18 shots, but they were punished for a lack of composure in front of goal, testing the impressive Wildsmith on only four occasions as they fell to a first league defeat since 28 November. Match ends, Sheffield Wednesday 2, Derby County 0. Second Half ends, Sheffield Wednesday 2, Derby County 0. Craig Forsyth (Derby County) is shown the yellow card for a bad foul. Sean Clare (Sheffield Wednesday) wins a free kick on the right wing. Corner, Derby County. Conceded by Joe Wildsmith. Attempt saved. Andreas Weimann (Derby County) left footed shot from the left side of the box is saved in the top centre of the goal. Assisted by Tom Huddlestone. Corner, Derby County. Conceded by Frederico Venâncio. Attempt blocked. Ikechi Anya (Derby County) right footed shot from the centre of the box is blocked. Attempt blocked. Kasey Palmer (Derby County) header from the centre of the box is blocked. Assisted by Craig Forsyth with a cross. Attempt blocked. Chris Baird (Derby County) right footed shot from outside the box is blocked. Assisted by Bradley Johnson. Substitution, Sheffield Wednesday. Jordan Thorniley replaces Glenn Loovens. Substitution, Derby County. Kasey Palmer replaces Matej Vydra. Attempt missed. Richard Keogh (Derby County) header from the centre of the box misses to the right. Assisted by Curtis Davies with a cross following a set piece situation. Attempt saved. Bradley Johnson (Derby County) left footed shot from outside the box is saved in the centre of the goal. Assisted by Matej Vydra. Substitution, Sheffield Wednesday. Liam Palmer replaces Jack Hunt. Andreas Weimann (Derby County) wins a free kick in the defensive half. Attempt missed. Matej Vydra (Derby County) left footed shot from the left side of the box misses to the left. Assisted by David Nugent. Substitution, Derby County. Ikechi Anya replaces Joe Ledley. Matej Vydra (Derby County) is shown the yellow card for a bad foul. Joey Pelupessy (Sheffield Wednesday) wins a free kick in the attacking half. Attempt missed. Tom Huddlestone (Derby County) left footed shot from outside the box is too high following a corner.